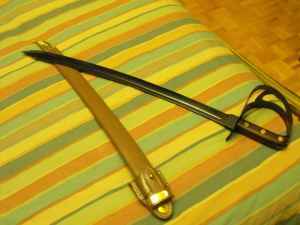 I saw your ad on Craigslist for the cold steel 1917 naval cutlass http://toronto.en.craigslist.ca/yrk/for/2142005566.html. I just have one question about it. WTF were you thinking when you bought a pirate sword? Seriously! Its not really a pirate sword but i got it cas i thought it looked cool, i need money for school so selling it now, are u interested in buying it though?